Fits into the tightest spaces - perfect for breakrooms. 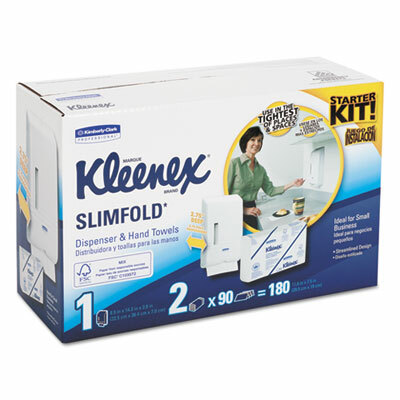 Includes two packs of highly absorbent Kleenex towels, for efficient hand drying. Dispenses one towel at a time, reducing waste. Towels meet EPA standards; FSC and EcoLogo certified. Dispenser item 06904, refill item 04442. Introducing the space-saving small wonder: the Slimfold™ Towel System. Just about everyone has a single restroom, break area, wash-up sink or other small space where typical towel dispensers are just too big. Enter the innovative Slimfold™ Towel System, specifically designed to fit into tight places without sacrificing hand-drying performance. The secret of this “small wonder” lies in designing high-performance towels with an innovative fold, then engineering an ultra-slim dispenser to fit neatly into the tightest spots. Height: 8 1/2" Width: 14 93/100"